The system provides CPR multimedia courseware teaching, operation process training and assessment. 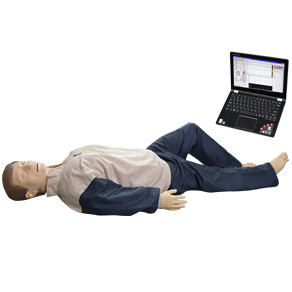 The system consists of CPR application software, full-body manikin, limbs trauma modules; it can simulate pupil changes, carotid artery pulse, CPR training and assessment, multimedia courseware teaching and limbs trauma. It is applicable for CPR training organization, hospitals, Medical colleges andMedicalSchoolfor CPR training. 3. CPR: instantaneous graphics displaying of data, statistic report, training evaluation for one or more person, optional sounds related to CPR. 4. Available standalone version and online interactive version. Standalone version can be upgraded to online interactive version. 3. GD/J110-4 Trauma module of limbs.